Abby the Librarian: Soar, Elinor! Soar, Elinor! by Tami Lewis Brown, illustrated by Francois Roca. (Grades 1-3.) Melanie Kroupa Books (Farrar, Strauss, & Giroux), April 2010. Unpaged. Reviewed from library copy. This book is a nominee for the 2010 Cybils Awards, and this review reflects only my own opinion. Elinor Smith took her first plane ride in 1917 when she was six years old. From then on, she was hooked. Her parents encouraged her to follow her dreams and in 1928, Elinor got her pilot's license. She was, at age 16, the youngest person (boy or girl!) to get a pilot's license. But still, many male pilots did not accept her. How could she prove that she was just as good a pilot as any man? By flying under New York City's four bridges, of course! Soar, Elinor! is an inspiring story that's sure to add much to Women's History units and book lists. You've got plenty on Amelia Earhart, so make room for Elinor Smith! Elinor kept flying, even when men said she couldn't do it, even when the newspapers said she was just playing around and called her "The Flying Flapper". The book does a nice job of showing what women went through in the 1920s. Illustrator Francois Roca sets the scene with sweeping paintings of 1920s New York. Many of the paintings fittingly show plenty of sky and I appreciate the fact that the sky looks different in every picture (different shades of blue, different cloud levels, etc.). Details like the clothes people are wearing and expressions on people's faces add to the overall historical feel of the book. You can tell that author Tami Lewis Brown cares about her subject and is passionate about flying. She includes a lovely author's note and source note, including photos of Elinor, her plane, and one of the bridges. The author's note includes some additional information about Elinor (she was, at 89-years-old, the oldest person to "fly" the NASA Space Shuttle Simulator!). Add this one to your Women's History Month displays, come March! Read more reviews at The Fourth Musketeer and Winged Victory. And read more about author Tami Lewis Brown at Cynsations, Through the Tollbooth, and From the Mixed-Up Files. 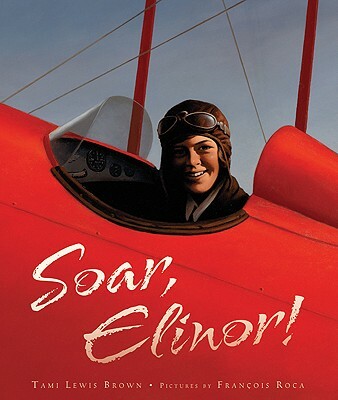 Soar, Elinor! is on shelves now.